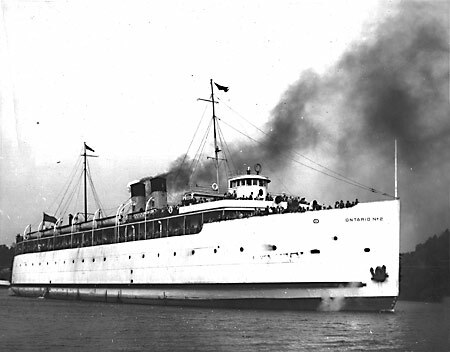 The Ontario Car Ferry Company was so successful with its train and passenger ferry route across Lake Ontario, that it ordered a second 'Ontario' to be built by Polson Iron works. The Ontario 2 was launched on April 3, 1915. She had the capacity of 30 standard coal cars of 70 tons each. The back of the photo says, "August 18, 1948. Last excursion steamer from Picton. Murray & Margaret Clapp and Rutherford went on the trip"
"The first master of ONTARIO NO. 1 was Captain F. D. Forrest and when the NO. 2 entered service he transferred over to the new flagship along with his chief engineer, A. Nichol. Capt Forrest died in 1925 and he was succeeded on the NO. 2 by Capt. C. E. Redfearn who had moved over from the NO. 1, being replaced on that ship by Capt. S. H. McCaig, longtime first officer of the ferries. The last master of ONTARIO NO. 2 was Capt. William Bryson." Ontario 2 was in active use until April of 1950, when, because of a fall in freight and passenger traffic and the need for expensive renovations due to changes in regulations, she was retired, and sold for scrap. The vessel was scrapped in 1952. Please check out the extensive article in the Scanner (quoted above).